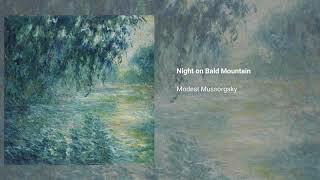 Night on Bald Mountain is a tone poem by Modest Petrovich Mussorgsky, a Russian composer and member of The Five, Mily Balakirev's group dedicated to producing a distinctly Russian kind of music. The piece was originally inspired by a short story by Gogol in which a peasant witnesses a witches' sabbath on the Bald Mountain near Kiev on St John\'s Eve. As with so much of this composer\'s music, the work had a tortuous compositional history, and is now known in several contrasting versions. The version that made the pieces name was the orchestration reworked by Rimsky Korsakov and published after Mussorgky's death.